Discussion in 'SN95 Cobras' started by Glenn W., Nov 25, 2016. 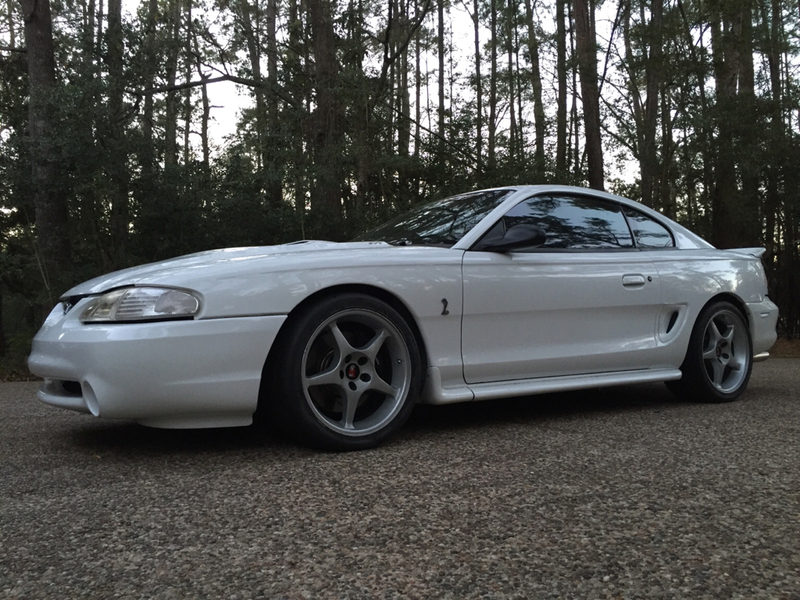 Offered for sale is a very special, VERY low mileage 1997 Cobra. I am moving to Alaska, and this is the only reason I have decided to part with this fun to drive Cobra. As you can see from the pics, this Cobra has been heavily and professionally modified for both appearance and handling. B and M Short Throw Shifter (best shifting action I’ve ever felt and it shifts like a rifle bolt and shifter shaft is super firm once in each gear). 2nd to 3rd shift is spring loaded to make sure a quick shift finds the correct gear. Saleen side skirts and trunk spoiler painted to match. Slotted and cross drilled rotors. Hundreds of dollars of chrome accessories under hood – including a polished intake plenum. There is some very subtle painted pin striping along the sides, hood and trunk. You have to look twice to see these, and they are grey and blue against the white – truly beautiful. Painted to match outside rear view mirrors. 3.73 Ford Racing rear gearing. Bassani Cat-back exhaust system makes this Cobra one of the best sounding I’ve ever heard. This is a full stainless system with chrome exhaust pipes fully polished and slightly bigger diameter than the stock exhaust. There is NO drone at highway speeds with this system. You have the choice of three different sounds with this exhaust -- fully open, or two different size baffles that easily and quickly install at the end of the exhausts with two set screws. This Mustang has been garage kept and extremely well cared for, and you will not likely find another Cobra offering all this one has with these very low miles. This Cobra still looks and drives like new. Thanks....now if there is only someone out there who appreciates a super high performance/handling car like this one! Amazing car and mod list, wish I could afford another!!! Got any pic of interior and underneath?? I will be happy to take some tomorrow and post them. The interior is nearly perfect, with only the driver's seat leather showing the appropriate checkering/wear pattern. Underneath is only going to be what I can get by laying on the ground.........I see you have a MM suspension as well, so you know what they install and how they handle. Yes, we have very similar mods to our cars. Yours is in much better shape, and very show quality. SOOOOOOO.....buy mine and sell yours??? Just a thought....To me, the Saleen side skirts sure change the profile of the car for the better, don't they? I have WAY too much invested in mine with the Coyote swap and suspension. Took it to the track for the first time since everything has been installed. As I said, would LOVE to buy yours, it's a great looking Cobra with great mods. Maybe next year when the wedding is paid off. And....freshly clay barred before covering it....SHINY! I've really got to get finished with this house purchase so I can buy something. Great car!!! It's been over a month since my last effort to get this thread to the top.......so here is another effort. Folks, this is a GREAT driving, handling and shifting Cobra. Still sounds and drives like a new car...only better. Fully open (a bit loud for my senior tastes, but my son loves it this way!) Even in this setting, there is NO drone on the freeway, just a nice soft V8 hum. Two different lengths of tubular baffles that have a set screw at each end of the dual exhaust. They slide into the exhaust tips, and each are about 10" long. One set is quieter than the other. Two fiberglass woven sheets that you can wrap around the middle of either baffle to quiet either one down. With the quietest baffle and the fiberglass sheet, this exhaust is quieter than the stock exhaust, but with a slightly deeper tone. So with two different set of baffles, and the fiberglass sheets in or out on each, this exhaust is VERY tunable to your personal tastes. Like you, I know that I've heard aftermarket exhaust systems that are beyond obnoxious. Bassani is the best sounding I've ever heard -- especially with the options you have to make it sound exactly the way you like it to. If I bought this could I drive it back home to ohio? Or would you not recommend such a long drive? I guess I should've asked if its still available first? I would drive this car to Boston today --- no problem --- weather permitting of course.